Childforms® now offers ChildShapersTM, a new line of modular play structures that are priced to fit any budget, packed with play value and ideal for any early childhood play environment. The structures come standard with Childforms® exclusive ChildTreadTM Skid Resistant Decks, while the accessible staircase has Childforms® exclusive Skid Resistant Stair Treads. Roof panels and steering wheels are constructed of high-density, UV-inhibited plastics that resist scratching and fading. Construction also includes stainless-steel fasteners, powder-coated steel framework and molded polyethylene slides. ChildShapersTM are surface-mounted for easy installation and future relocation. Miracle Recreation introduces the latest addition to its growing line of innovative, convertible components: the Scale-N-Slide. Designed to provide challenging access or exit for an 8-foot-high deck, the Scale-N-Slide features a fun, sculpted climber on one side and a fast, one-piece speed slide with vertically grooved bedway on the other. Available hardware lets installers simply reverse the component when your playground is ready for new excitement. For your free copy of the new 2004 Park & Play Equipment Catalog complete with the new Scale-N-Slide and hundreds of other big playground ideas, contact your Miracle consultant. One of the best things we can do for kids is to encourage them to love motion, to relish the feel and the challenge of movement. Innovative Agito play equipment by HAGS provides features and components that move in challenging ways. For more information, contact your HAGS/Miracle sales consultant. Landscape Structures offers two new climbers—the Conical Climber and the Corner Climber—that feature real climbing-gym-style handholds mounted on a flexible, high-strength PVC material. They both provide popular and challenging rock climbing experiences that kids love and can be used with the PlayBooster systems. The Conical Climber is also compatible with Landscape Structures' PlayShaper System for 2- to 5-year-olds. The reinforced PVC belt material is mounted to a tubular steel frame that's anchored to the ground. The movement of the flexible material within the frame provides an added challenge to climbers as they make their way to the top. 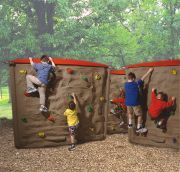 NICROS, Inc., a nationally renowned rock climbing wall construction company, has announced two unique products: Nicros-EasyWallTM and NICROS Playground Boulders. Nicros-EasyWallTM is a uniquely designed rock climbing wall panel system that is named "Easy" because installation is as easy as bolting it to an existing wall. It is a light-weight 4-foot-by-4-foot rock climbing panel and comes with handholds, mounting hardware and an installation manual. NICROS also has new Playground Boulders, which are a fun and attractive addition to any playground setting. These carefully crafted works-of-art are molded from real rock with "all-natural" climbing features. Highly durable and stain-resistant, they come in three standard shapes and are climbable by the smallest of tots to the older playground-goers. Nicros-EasyWallTM and NICROS Boulders add to Nicros' already large line of products and services for any rock climbing wall construction project—new or old. The KoalaPlay Group showcase in Gorky Park in Moscow features a Double Twist SkyTwist Slide, a Drop Slide from the fifth level, web bridges, tube crawls, bright primary colors and more than 33 activities. Construction of the materials took into account the extreme Russian winters. All pipe and tubing is galvanized steel, all hardware (nuts, bolts, washers, screws, etc.) and materials are stainless steel, and blasters are galvanized and coated with a special UV protecting paint and spray. Gorky Park is located just across the Moskva River. The playground is filled with families and offers spectacular views of the city. The WingWallTM from Brewer's Ledge is an innovative climbing structure for playgrounds. Each WingWallTM is a fully molded rock-like climbing structure that's 6 feet tall by 8 feet wide. They can be purchased alone or linked together to form a single climbing area. Mounted on a central pole, they can be reoriented by staff into new, locked positions that continually reinvigorates the playground. Kids climb up, across and around the maze for hours of fun. Units are built under strict IPEMA standards to ASTM/CPSC requirements and designed by Brewer's Ledge, with more than 13 years of experience building climbing walls. Developed with the assistance of child-development experts, daycare providers, teachers and parents, EcoPlay® equipment encourages socialization and develops problem-solving capabilities. The equipment conforms to current ASTM standards and CPSC guidelines and meets ADA accessibility standards. Although it has the appearance of traditional wood, EcoPlay® never needs painting, treating or sealing; it's impermeable to water and won't swell, split or rust; it won't decay or degrade, crack or splinter; it's environmentally friendly, safe and nontoxic; and it cannot be eaten by insects or micro-organisms. With EcoPlay®, maintenance costs are minimal, and it comes with a 50-year warranty.